Bake for Happy Kids: Quick Easy and Healthy Basil Chicken - Kids Friendly too! Quick Easy and Healthy Basil Chicken - Kids Friendly too! Hi! I'm back! ... Back from our fun and fabulous Osaka plus Singapore holidays. Our holidays was so good that my son actually had tears in his eyes when the plane touched down at Melbourne airport. "I missed all the fun and food that we had." said my son in a sorrowful voice. Now back to our daily life, we are craving for fresh and healthy home cooked food. Are you the same after a holiday that indulge in rich and delicious food? 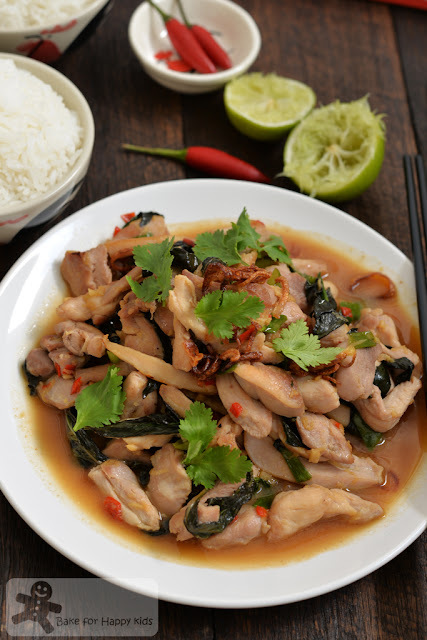 Here's a simple home-style chicken dish that my husband absolutely adores!!! Interestingly, this delicious dish has converted my basil-hating son to enjoy eating basil too! 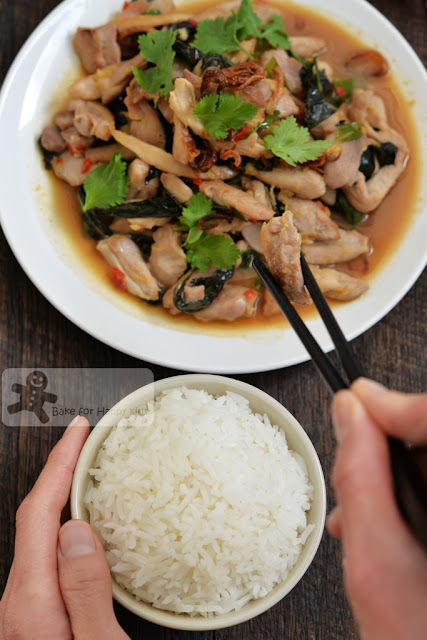 Hence, without saying much, I'm happy to show you how I cooked this easy, healthy and flavoursome 知足常乐 dish and hope that you will like it as much as we do. This flavorsome and sweet-smelling dish is the best to enjoy with plain white rice. This I say... 100% satisfaction!!! It's so easy!!! Watch my one-minute video to see how I cooked this simple yet very satisfying meal. *If you choose not to use a sieve to drain the rice thoroughly, you can assume that the amount of the retaining water in the roughly drained rice is about 1/2 cup (125 ml). Hence, instead of adding 2 cup (500 ml) water into the thoroughly drained rice, you can add 1 1/2 cup (375ml) water into the roughly drained rice. 1 red chilies, finely chopped - you can use either long or the hot bird-eye (more spicy) or more chilies according to your preference. You can use either a rice cooker or a large cooking pot to cook the rice. If you are using a cooking pot, add water into the rice and bring the rice mixture to boil. Reduce heat to very low and simmer for 15 mins without stirring or until all the water has been absorbed. Then, cover the pot with a tight-fitting lid. Turn off the heat and allow the rice to rest for at least 10 mins. Please note that this resting step is very important. Combine lime juice, sugar, fish sauce and soy sauce in a small bowl. Stir until the sugar is dissolved. Set aside. Using HIGH heat, heat 1/2 tbsp oil in a wok or a large frying pan. Add garlic, ginger and chili. Stir and fry for about 1 min or until fragrant. Remove garlic mixture from the frying pan and add another 1/2 tbsp vegetable oil to heat. When the oil is hot again, add chicken and cook for about 5 mins until the chicken is nicely browned and thoroughly cooked. Note: For me, I always prefer to cook the chicken in two batches - see the above video. To do so, cook half of the chicken first until they are nicely browned, then remove from the frying pan. Heat another 1/2 tbsp oil and cook the remaining chicken until nicely browned. This additional cooking step will make sure that the chicken are all nicely browned without releasing too much of its juice. With all of the chicken still in the frying pan with high heat, add the cooked garlic mixture back into the frying pan and cook for about 1-2 mins with continuous stirring until all are well incorporated. Turn off the heat. Stir in spring onions, basil and the fish sauce mixture immediately while the chicken is still hot. Taste and add more fish sauce or soy sauce if desired. Garnish with crispy fried shallots, coriander leaves or extra sliced chilies if desired. Serve immediately with steaming hot rice. Your instagram pics had me salivating and making lists of places to eat when we head to sibgaporr next week... hehehe love this delicious chicken dish.